Aaron Charles Donald (born May 23, 1991) is an American football defensive tackle for the Los Angeles Rams of the National Football League (NFL). He played college football at Pittsburgh, where he was recognized as a unanimous All-American. He was drafted by the Rams in the first round of the 2014 NFL Draft. A native of Pittsburgh, Pennsylvania, Donald attended Penn Hills High School. He was selected first team All-State Class AAAA in each of his final two seasons, and compiled 63 tackles, 15 tackles for loss and 11 sacks as a senior. He also started at offensive guard. Considered a three-star prospect by Rivals.com, he was rated as the 37th best defensive tackle in the nation. He committed to hometown Pittsburgh over other scholarship offers from Toledo, Akron and Rutgers. As a freshman, Donald played in all 13 games as a reserve defensive tackle. He recorded 11 tackles, including three for loss, and two sacks. In 2011, as a sophomore, Donald moved into the starting lineup, and turned in a breakout campaign. He recorded 47 tackles, including 16 for loss, 11 sacks and one forced fumble, and was named a second-team All-Big East selection. As a junior, he recorded 64 tackles, including 18.5 for loss, 5.5 sacks, and one forced fumble, earning first-team All-Big East honors. In his senior season, he became one of the most productive defensive players in the entire NCAA. He posted 59 tackles, including a career best 28.5 for loss, 11 sacks and four forced fumbles. He was named the ACC Defensive Player of the Year and was a unanimous All-American. He also won the Lombardi Award, Bronko Nagurski Trophy, Chuck Bednarik Award and Outland Trophy. At the NFL Combine he set the record for fastest time for a defensive tackle previously held by Tank Johnson, who ran a 4.69 in 2004. Donald drew comparisons to John Randle afterwards. He was selected by the St. Louis Rams in the first round of the 2014 NFL Draft with the 13th pick overall. On June 16, 2014, the St. Louis Rams signed Donald to a four-year, $10.13 million rookie contract that is fully guaranteed. The contract also includes a $5.69 million signing bonus and a fifth-year option. On September 7, 2014, he made his regular season debut against the Minnesota Vikings and finished the game with four tackles. The following week he recorded three tackles and his first career sack during a 19-17 victory over the Tampa Bay Buccaneers. On October 13, 2014, he was given his first career start against the 49ers and finished the contest with four solo tackles. After recording 47 tackles, nine sacks and two forced fumbles, he was one of five rookies selected to the 2015 Pro Bowl. On January 31, 2015, it was announced that Donald had won the 2014 NFL Defensive Rookie of the Year award. In 2015, Donald would begin the season as the Ram's starting defensive tackle. During their season opener against the Seahawks, Donald recorded a career-high nine total tackles and two sacks, helping the Rams win a 34-31 overtime victory. On December 13, 2015, Donald made five tackles and a career-high three sacks against the Detroit Lions. Donald started all 16 games and ended the season with 69 tackles, 11 sacks, a pass defended, and a fumble recovery. He was a Pro Bowl selection for the second consecutive season. On September 12, 2016, Donald was ejected for the first time in his NFL career for making illegal contact with a referee. On September 16, 2016, Donald was fined $21,269 for unnecessary roughness ($9,115) and unsportsmanlike conduct ($12,154). On October 21, 2016, he was fined $18,231 for an unsportsmanlike conduct after commuting the penalty during a game against the Detroit Lions. ↑ "Sportrac.com:Aaron Donald contract". Sportrac.com. Retrieved October 28, 2016. 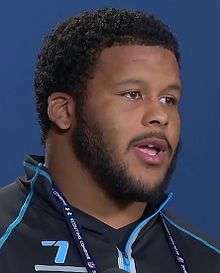 ↑ "NFL Player Profile:Aaron Donald". NFL.com. Retrieved October 28, 2016. ↑ Meyer, Max. "Rams defensive tackle Aaron Donald ejected in loss". NFL. Retrieved September 12, 2016. ↑ Meyer, Max. "Aaron Donald not expected to be suspended". NFL. Retrieved September 13, 2016. ↑ Shook, Nick. "Fines: Aaron Donald docked $21K for two infractions". NFL. Retrieved September 16, 2016.